Who wouldn’t love a summer retreat with a rooftop pool? 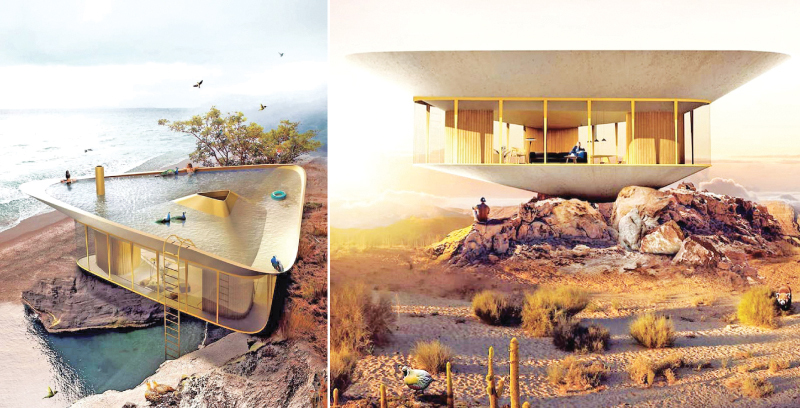 Anti Reality takes that concept one step further by creating a modern vacation home where the roof is the pool. That’s correct, by inverting the home’s roof, they’ve created a basin that is perfect for luxuriating while gazing at the seaside views. Summer House is a 914-square-foot (85-square-meter) one-story dwelling meant to be perched on a coastal cliff. The innovative pool is a standout, but that’s not the only thing that makes this concept build-worthy. With a wraparound outdoor walkway and panoramic windows running the entire interior, Summer House is the definition of indoor/outdoor living. “One of the key design intents was to create a building that would be completely open to the surroundings, providing the possibility to observe and engage in direct contact with nature,” Anti Reality shares. “The Summer House has been designed with seasonal recreation and weekends outside the city in mind.” In terms of privacy, there are three structural cores that can be configured according to how the interior is used. Each core holds a different function - bathroom, kitchen, and bedroom - and can be as open or closed as one would like. It’s even possible to open them up entirely, creating a freestanding wall that wraps the entire interior. In this way, Summer House can be as open or closed as the homeowner would like. The pool, which is accessed by an exterior ladder, has controllable water levels thanks to a siphonic drainage system. The roof outlets are located above each of the three structural cores, which allows the downpipes to pass through the interior into an inspection chamber. With all the basics thought out, the only thing left to do is pack your bags and enjoy the view.